The art lovers of the city were in for a treat, a royal treat indeed, as Gallery 6 opened its doors to a collection of rare miniature paintings of British and Indian royal families and rulers. The exhibition of portrait miniatures, small in size and scrupulous in detail with fine brushwork, depicted the charm of a bygone era. 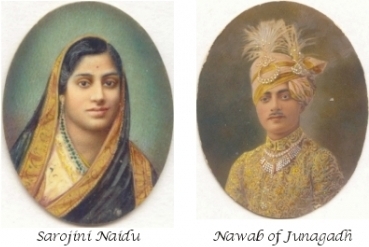 Although the paintings are decades old but the grandiosity in the portraits of bejewelled Indian Maharajas and Nawabs, the adamant self-confidence in the miniatures of British kings and viceroys, and the feminine grace and beauty such as in the portrait of Sarojini Naidu, can still be felt in the artworks dexterously portrayed by Hafiz Sheikh Mohammad Amin and Sheikh Moin. “The paintings are 70 to 80 year-old and were done by leading artists of their times: Hafiz Sheikh Mohammad Amin and Sheikh Moin,” said the curator of the gallery, Dr Arjumend Faisel. Over 40 rare and historic artworks have been put on display at the two-day exhibition. The exhibition was facilitated by Sheikh Mohammad Mansoor, the great grandson of Sheikh Amin and grandson of Sheikh Moin, who inherited these rare and historic impressions, told the curator. 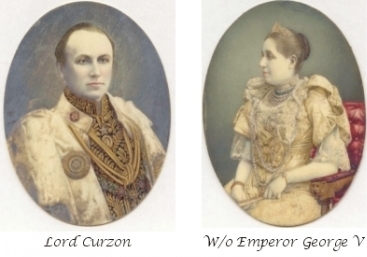 Among the portraits of some of the British royal figures hung on the walls are of Victoria Mary Augusta (wife of King George V), Victoria Alice Mary (the only daughter of King George V), Prince Philip (Duke of Edinburgh), Prince Andrew, Lord Curzon (Viceroy of India) and others. Among the Indians were Kasturba Gandhi (wife of Karamchand Gandhi), several members of the Tata family, Sarojini Naidu (first Indian woman to become the president of Indian National Congress), Hakim Ajmal Khan (President of Indian National Congress), Gopal Krishna Gokhale and Sir Pherozshah Mehta (leaders of Indian National Congress), Maharaja Sarajirao Geakwad (Maharaja of Baroda), Nawab Mir Mahbub Ali Khan Bahadur (Nizam of Hyderabad Deccan), Sir Mohammad Mahabat Khanji III (Nawab of Junagadh State) and many others. According to Dr Arjumend, Hafiz Amin was born in 1850 and lived up to the age of 65 years. He established S.M. Artist Co. that specialised not only in producing paintings in water and oil colours but also in miniature paintings on canvas and ivory. His son Moin was born in 1897 and followed the in the footsteps of his father till his death in 1958.Both father and son became well-known artists in their times. In miniatures, they mainly worked for the British and Indian royal families and rulers and made their portraits. The miniature art thrived in the Indian subcontinent under Mughal rule during the 16th century, just about the same time when Portrait miniatures began to flourish in 16th century Europe. A miniature portrait painting, usually executed in gouache, watercolour, or enamel, is intricate handmade illuminations prepared immaculately with delicate strokes of the brush.